Community Finance Ireland are pleased to have been in a position to support yet another “first to market” within the Social Economy space on the island. Given the growth in Social Innovation among both Communities and Social Entrepreneurs alike, the provision of a Social Enterprise Toolkit is a natural, relevant progression in the evolution of a collective industry calling out for supports in various forms, not just at the point of start-up, but also for those seeking to transition to that “next phase”. An important factor in Community Finance Ireland deciding to fund this initiative was the ability of the Toolkit to be added to, as new supports are made available from both state, private and “more than profit” entities. This will ensure the Toolkit can adequately adapt to change, an intrinsic feature of modern Social Enterprise. Dublin South City Partnership (DSCP) is a Local Development Company which addresses issues of disadvantage, unemployment and social exclusion across a large part of south Dublin city. The area we cover has a population of over 130,000 and incorporates a very diverse range of communities, some of which have many needs. DSCP provides a range of services, ‘from cradle to grave’, in an effort to meet these needs. These services include support for community childcare projects, education programmes for children and adults and a range of services supporting unemployed people on their journey back to education, training and work. We also support individuals and groups who are developing small enterprises. An important part of our brief is to work in partnership with various community and state agencies. Accordingly, we support a whole range of community groups on issues such as disability, older people, interculturalism, social regeneration, community safety and neighbourhood development. The issues we deal with are often complex and difficult. Our approach focuses on making a practical difference to the lives of individuals and communities. To make this difference we are committed to working in a cooperative manner with the communities which we aim to serve. Training, Mentoring, Events, Grants and Promotion of social enterprises through articles on www.Dublin.ie for example. The SEC will identify specific areas of need and opportunity for social enterprise as an opportunity for co-creation within the council area. The SEC will review suitable business sectors for Social Enterprise particularly strong growth sectors that have a developed ecosystem and that have significant scale or potential to grow in Dublin City. The Irish Social Enterprise Network was set up to give the social enterprise sector a space, a platform and a voice. We have always strived to help people get their social enterprises off the ground or take them to the next level. Part of this work is to assist social enterprises in their development, whether they be pre-startup, startup or established social enterprises. 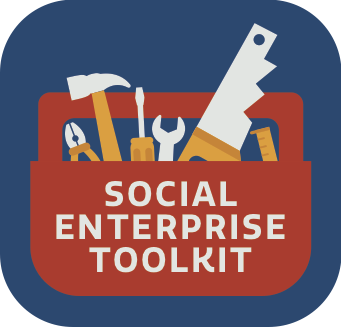 This toolkit is an effort to begin to move social enterprises from surviving to thriving. We hope that it becomes the start of the journey for people considering joining the world wide movement of organisations that seek to make the world more socially minded and sustainable. We hope that you find value in this toolkit and seek to further your learning through our network. This Toolkit has been prepared with a recognition that it can be difficult for both individuals and communities to set up social enterprises. It could not have been completed without the support of Community Finance Ireland, Dublin South City Partnership and the Dublin City Council. The strong work of the Irish Social Enterprise Network and the volunteer board of directors are a continued support and none of this would have been possible without their dedication and hard work. The person involved in the production and preparation of this report was Chris MM Gordon from the Irish Social Enterprise Network. Although every effort has been made to ensure the accuracy of the material contained in this publication, complete accuracy cannot be guaranteed. None of the parties involved in commissioning this report nor the author accepts any responsibility whatsoever for loss or damage occasioned, or claimed to have been occasioned, in part or in full as a consequence of any person acting or refraining from acting, as a result of a matter contained in this publication. All or part of this publication may be reproduced without further permission, provided the source is acknowledged.